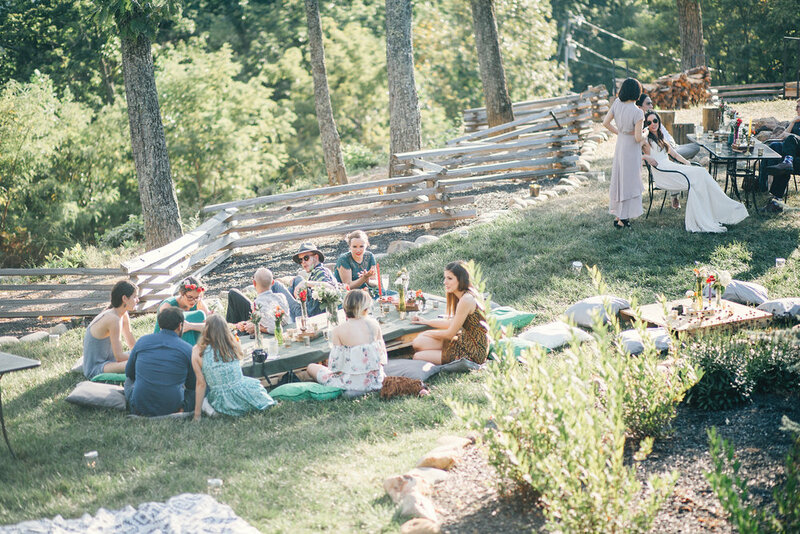 This July wedding was everything we could have dreamed up for a perfect summer wedding. The greenery, the lights, the coolest, most adorable couple ever…oh and of course, Samson, the super cute Golden who made the day impossibly cute! We’re so excited to share one of our all time favorite weddings. Meet Nick, Abby, and their sweet fur-baby, Samson! 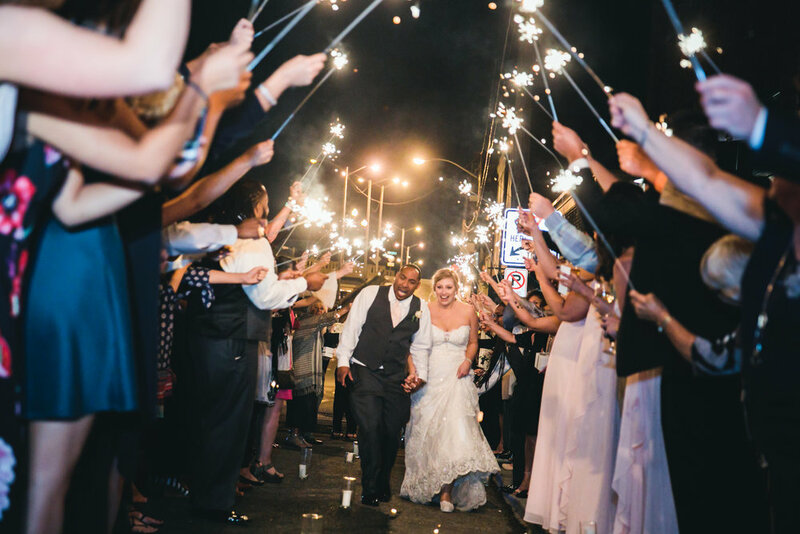 When they met with us, they described their perfect wedding day as a mix between industrial and summer garden party, but they weren’t sure how to pull it off. Luckily for them we knew exactly the dream team of vendors to pull of their vision! All of the amazing moments of this day were captured beautifully by JOPHOTO . The day began with hair and makeup by the talented team at Bangs and Blush. 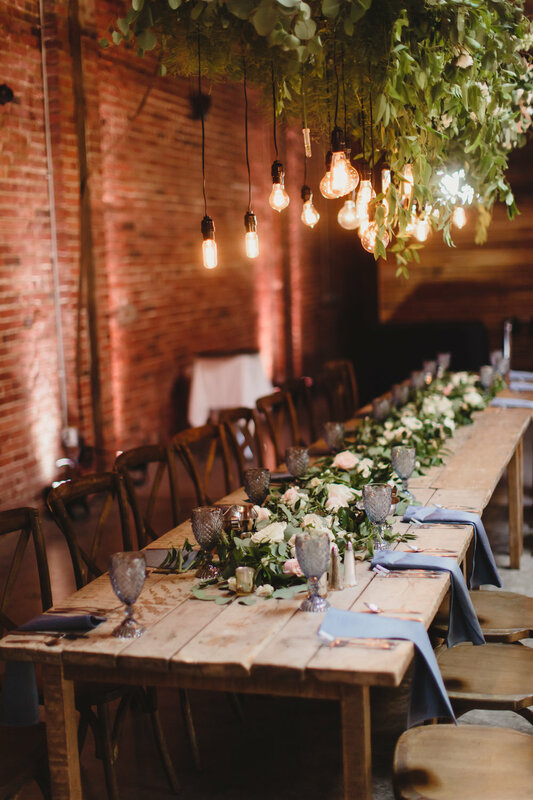 For the ceremony and reception area, we knew we had to have the perfect team to transform the Standard from an industrial backdrop into a summer garden wonderland. 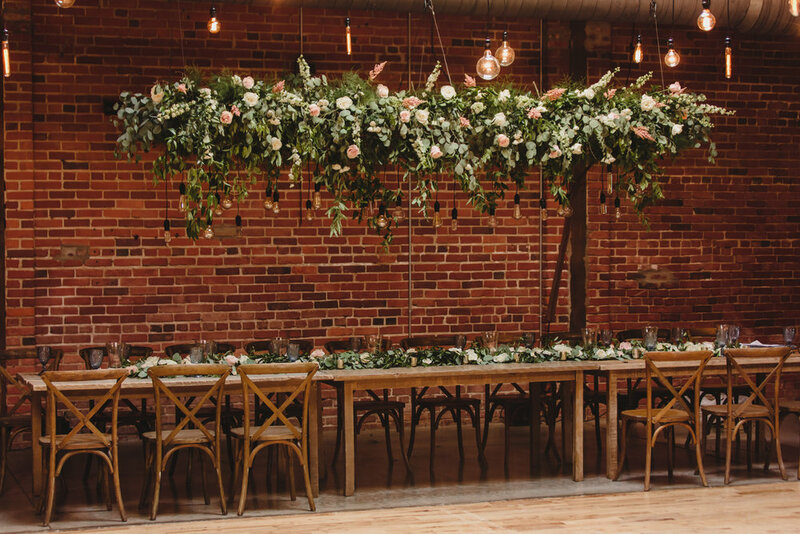 We trusted the floral design to LB Floral, and they spent months designing and hours installing greenery across the beams, on the walls, and tables to create a lush display within the industrial setting of the venue and the bouquets. 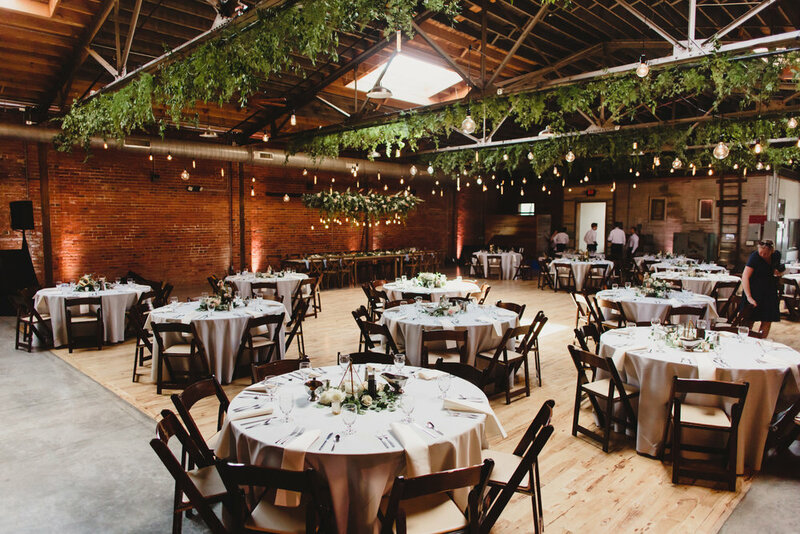 Hanging from the beams, we brought in Bright Event Productions to install hundreds of edison bulbs from the ceiling to create a dreamy, garden patio atmosphere. The DJ from Ogle Entertainment not only rocked the dance floor but killed it with amazing uplighting, the bartenders from Pour Guys and the amazing caterers from Bradford Catered Events made the reception perfect. We put some of our signature Team Wedding touches into the day, like the hand made number signs that matched the wood of the venue. We also had a custom brewery sign made for the couple’s home brewing company. 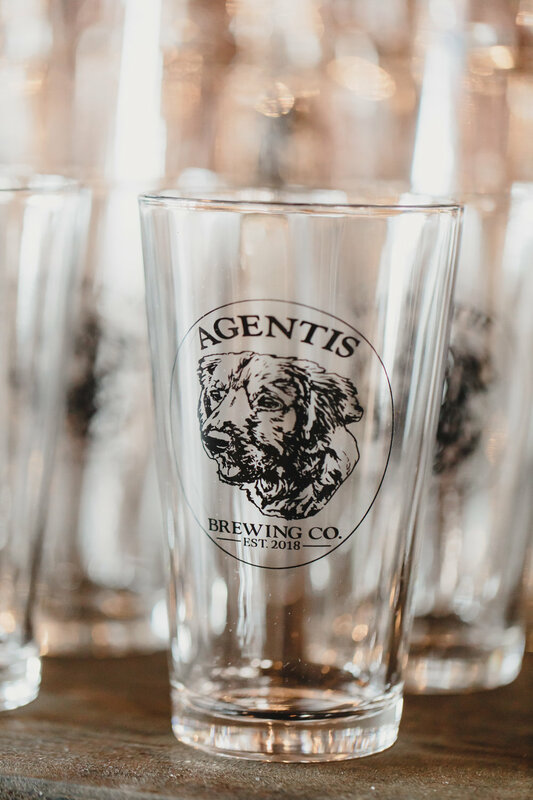 They had the logo put onto glasses for favors which we looooved! The couple also handmade olive oil favors for their guests, and the talented Tri Star Scribe made custom seating tags for them! It was a wonderful evening with the sweetest people ever, and we were so happy to help make their vision come to life. You can check out more on our Pinterest page and pin your favorite parts of their day! Oh, these two! My soul definitely felt like I'd found kindred spirits when I met these sweet birds! Let me introduce you to Amanda and Cameron! Amanda contacted me about doing a 20s-40s style, speakeasy wedding...MY DREAM! As soon as we got to planning, I realized that not only did I have one of the best weddings ever to work on, I had such an amazing couple to get to know! The two met at at diabetes summer camp, and had a romantic love story that spread over the years. 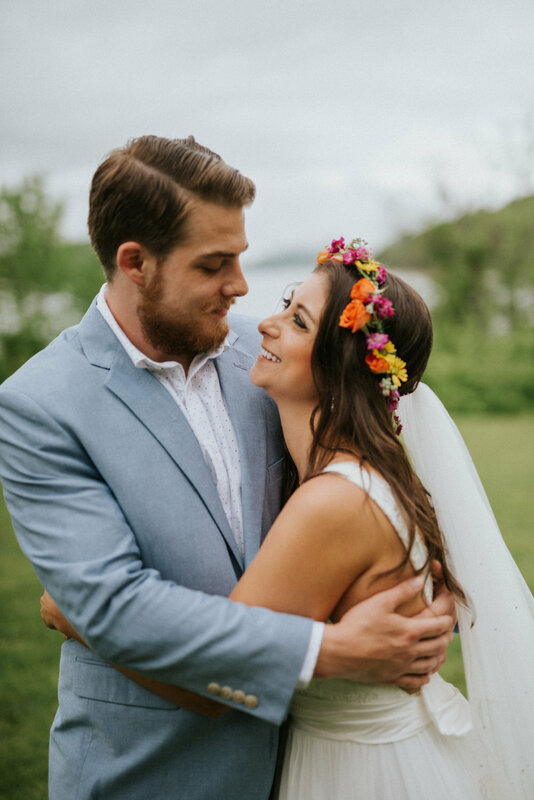 They came back to Tennessee to have their wedding at the Millstone in Dandridge, where Amanda grew up. Although it poured rain all day, we turned the reception barn into a speakeasy with amazing details to bring the theme to life. We are so excited to share this special day, with stunning images from Leah Moyers Photography! Amanda's retro hair and make up was done by Southern Belle Beauty and the floral and catering was done by Main Street Catering. The rain didn't keep us down, we moved the ceremony inside! Guests all showed up in 20s themed costumes, and the centerpieces were collected cigar boxes, vintage books, and antique liquor bottles. The ceremony included an intimate hand-fasting ceremony, and lots of happy tears! Cameron walked down the aisle to the theme song from Peaky Blinders, and it was pretty much the coolest thing I've ever seen a groom do. The rain didn't stop the party at the reception either! After the IDOs the couple and their guests cut a rug, with our favorite part of the night...a live band! Megan and Her Goody Goodies had us swinging the night away. And let's talk about FAVORS! These two had a unique speak easy mug exchange where guests brought a mug and took a different one home! All the liquor...we mean "tea"...was served out of these mugs! We loved the speak easy style bar set up, it's one of our favorite projects we've ever done! They also had adorable honey jar favors for guests to take home, with our custom designed labels. To see more of Amanda and Cameron's roarin' 20s wedding check out our Pinterest! 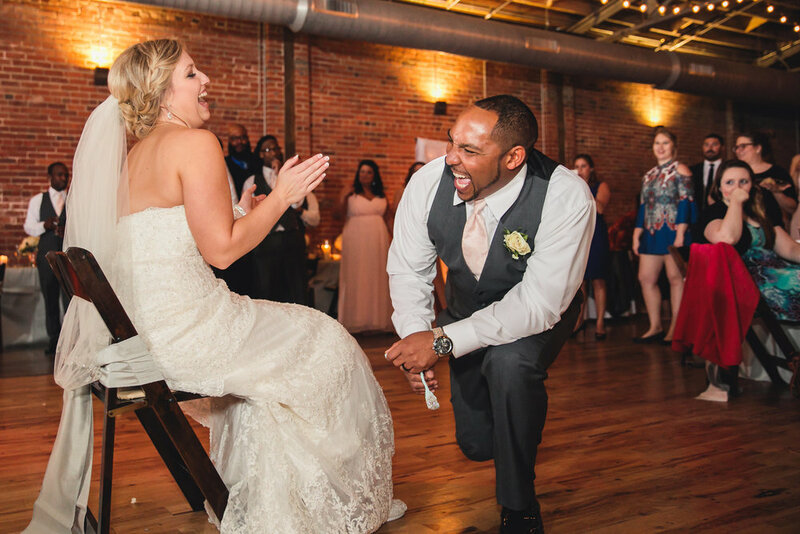 We adore love stories here at Team Wedding, but we REALLY adore this one. Once upon a time, I went to highschool with the sweetest girl named Krista. 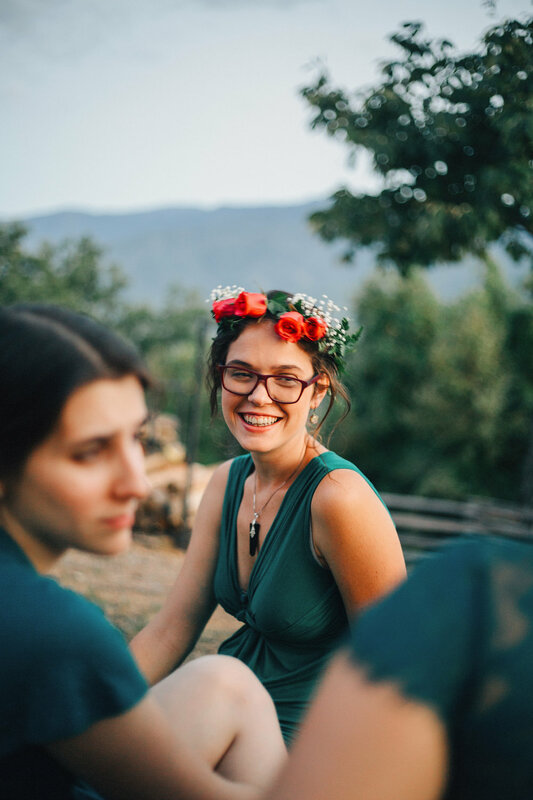 When she got engaged, I was so thrilled that she immediately reached out to me so I could help her plan her dream wedding to the man of her dreams, Kevin. We're so excited to share this special day with you, captured so amazingly by Jennie Andrews Photography. As you can see here, they're the most adorable people ever. But besides being so sweet and kind and funny, they also have the best, nerdiest, wonderful love story ever. Krista and Kevin met online playing World of Warcraft. When I first heard that, it didn't surprise me as Krista was an avid player in high school! But what made it even better, is that they started talking to each other because they were waiting for the same book to come out, and when it did they read it together. YOU GUYS. We can't even handle how adorable it is! 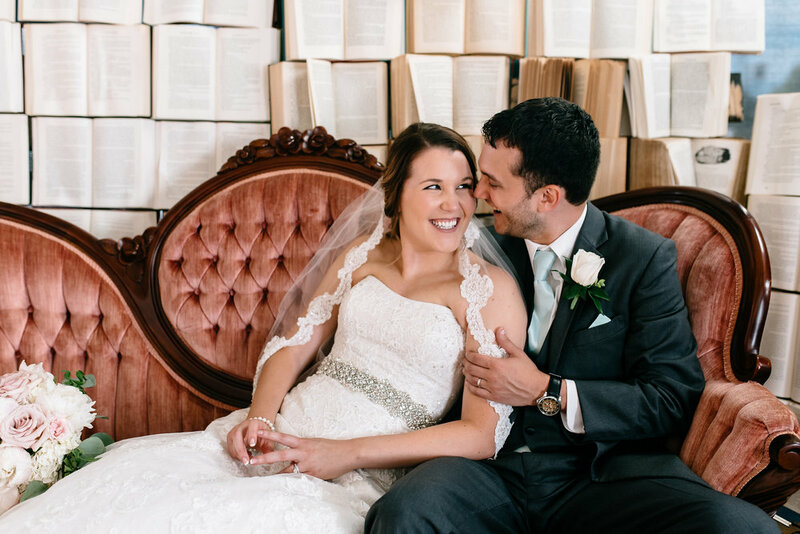 They ended up falling in love, and to start their happily ever after Krista and Kevin wanted to use their love for reading as inspiration for their perfect day. 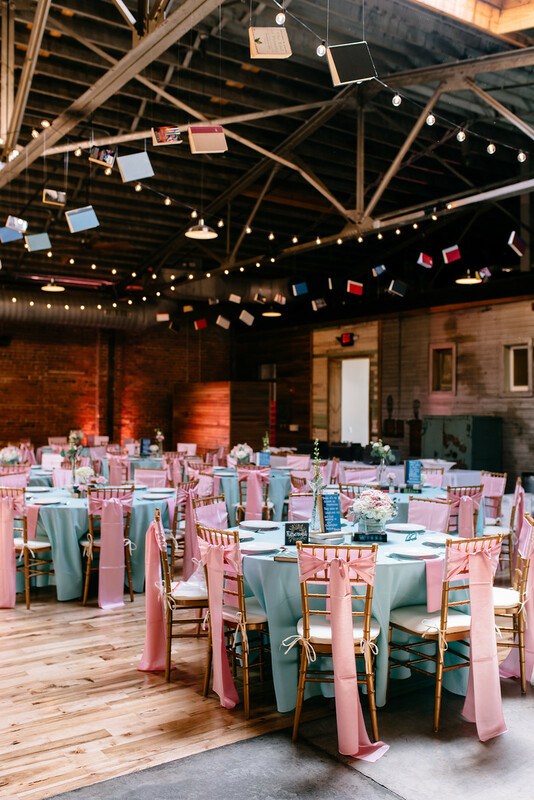 I was so excited by the opportunity to combine Krista's beautiful blush and teal color palette with a vintage flare of books. 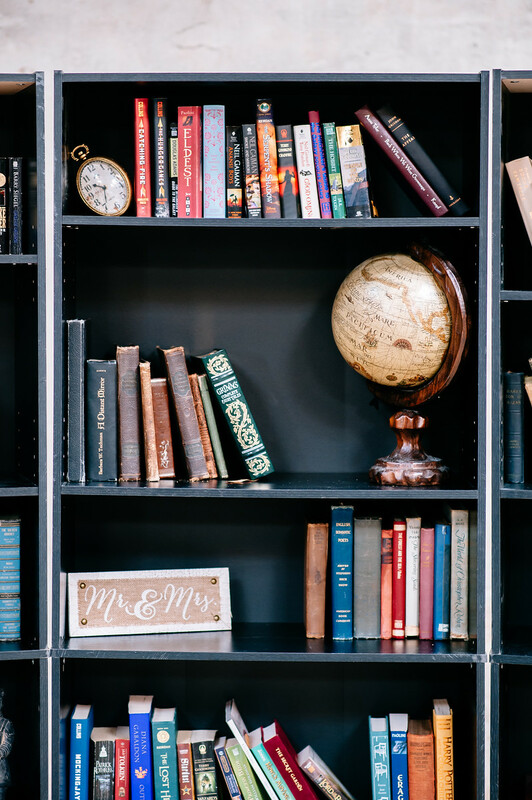 For the ceremony, we created a library backdrop using all of their most cherished and treasured books. We added trinkets and vintage items to give it a cozy, vintage reading room feel. But we couldn't stop with just the backdrop. 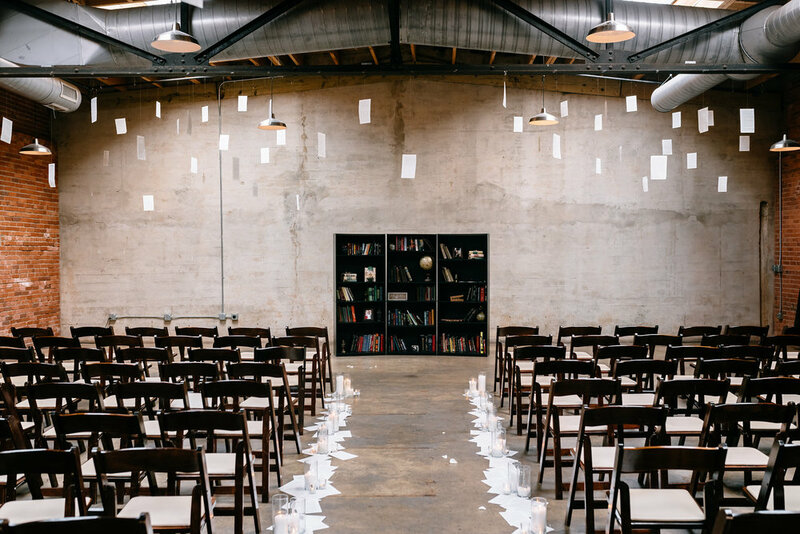 We really wanted to give the room a truly magical feel, so we surprised Krista and Kevin with pages suspended in the air of their favorite novels. But to me, the most magical part of this ceremony is that I had the overwhelmingly joyful honor of writing the vows for Krista and Kevin. I wrote them in theme for our book lovers starting their own story, and for their unity ceremony the two actually used an old feather pen to write the first line of their vows. With the help of Tri Star Scribe, the vows were then finished so they could have them to keep forever. The ceremony was beautiful, but the reception was the real treat of the evening! For cocktail hour, the couple had two signature drinks that perfectly captured their "punny" personalities! We wanted to give everyone a truly unique and fun experience for the photobooth, so we built giant book palettes to place behind Sisters Vintage breathtaking audra couch! After cocktail hour, guests entered the reception, which was one of our favorites of all time. We used teal linens from White Table and gold chivari chairs with pink chair sashes from Events by Rothchilds to bring her vision to life. 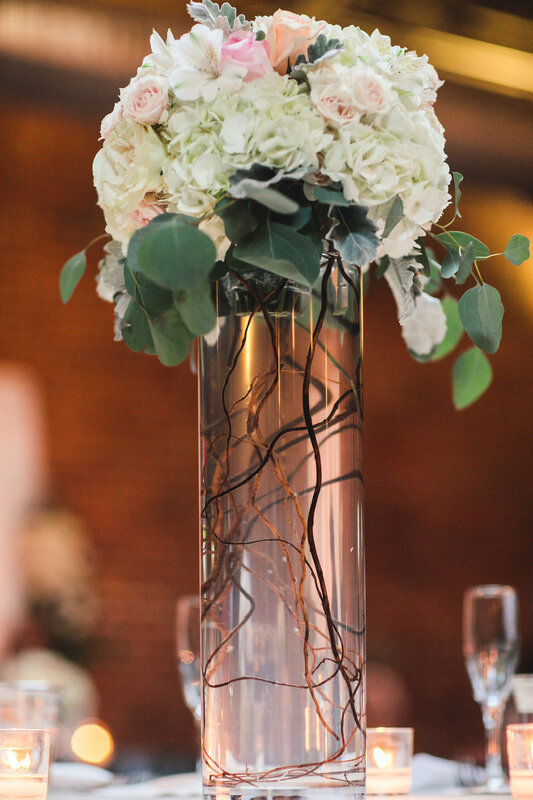 From there Lisa Foster Floral Design added a delicate beauty to our centerpieces and the bouquets! We really wanted to incorporate not only their passion for reading, but the books and words that mean the most to them. 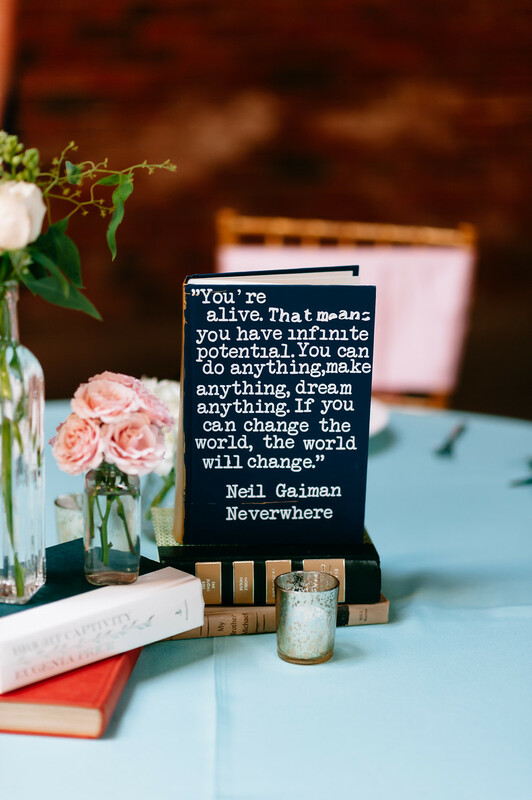 Each table featured a quote from one of their favorite books about love and adventure. But we couldn't leave it at just books there! We had another surprise up our sleeves for our two page turners. We hung over 200 books from the ceiling, to create a magical feel throughout the entire room. Once our bride and groom arrived, the party started. It would not have looked anywhere as wonderful as it did, or had anywhere near as much fun without our DJ and master uplighter Jim Ogle from Ogle Entertainment! There were so many incredible moments during the night, but there's one in particular that me or anyone there will never forget. A few months before the wedding, Kevin's father passed away. To honor his memory during the wedding, they brought his hat and cooler full of Old Style, the beer he always drank. During the reception, the grooms uncle made a toast to his late father, and all his family members joined him on the floor to grab one of the beers in remembrance of him. I've seen a lot of touching moments at weddings, but this takes the cake for the most perfect, special toast to a loved one I've ever seen. Kevin and Krista are two incredibly special and wonderful people. From start to finish, it was such a special thing to be a part of making this day just as perfect as they are. Dressof their big dayThank you for letting us get carried away with love and adventure to make this one of our favorite weddings ever, for one of our favorite couples ever! And a HUGE thank you to all our vendors who made the day so incredible! 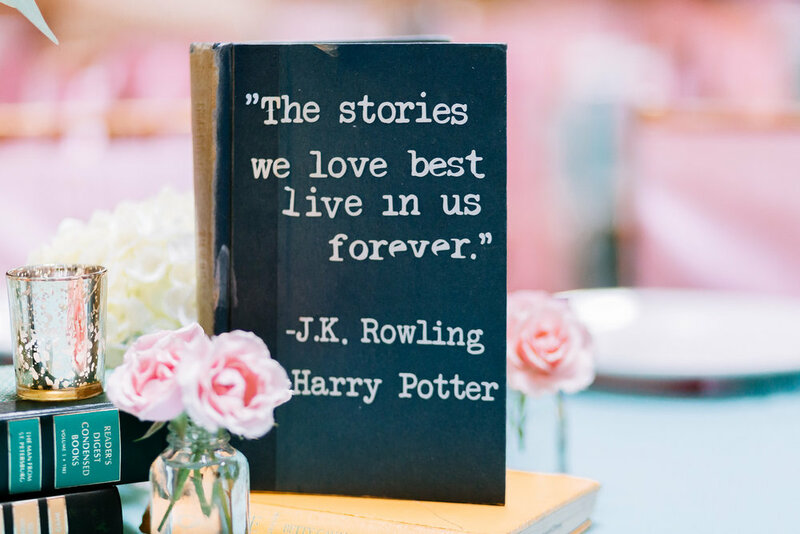 To see more of this amazing book themed wedding, check out our Pinterest! This wedding was so special to me for so many reasons. But the biggest one is that Brittany and Nathan became a good friend of mine during the planning process, and I'm so lucky to have been a part of their big day. 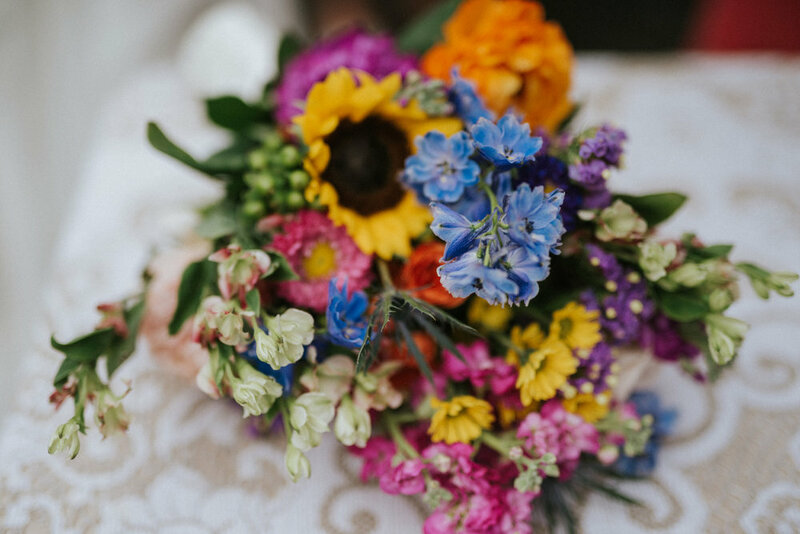 We're happy to share this color, free-spirited wedding that was captured so perfectly by Oak and Iron Photography. Mutual friends of ours introduced Brittany and I, and after our first meeting we just hit it off. I was so excited and inspired by her creativity and vision, and it was such a joy to help make it a reality. The day was accented by beautiful wildflowers and bright colors on the bridesmaids dresses. An intimate ceremony was held at her grandmother's home, followed by a joyful champagne toast. While there, Oak and Iron captured some magical couple portraits before heading to the reception. The reception took place back in Knoxville at the Relix Variety Theater. It's one of our favorite venues because it's so unique! 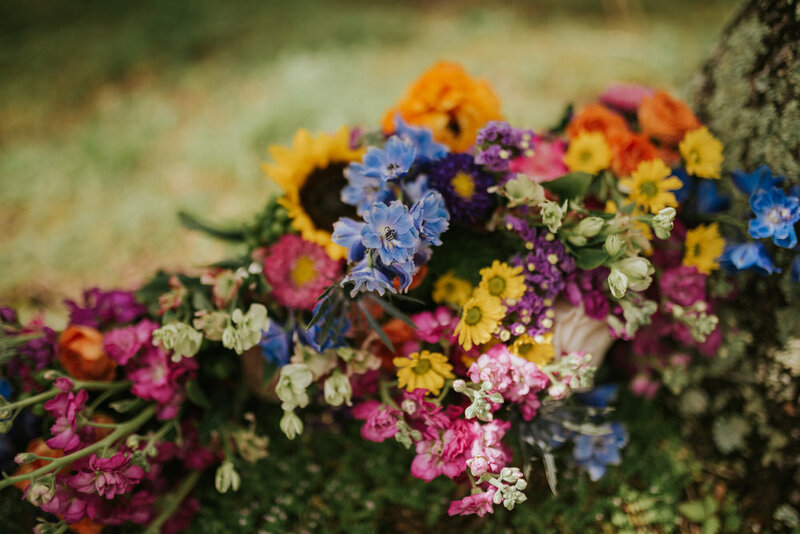 Brittany wanted to honor her Mexican heritage, so the day was infused with Mexican accents, and the centerpiece echoed her ceremony wildflowers. 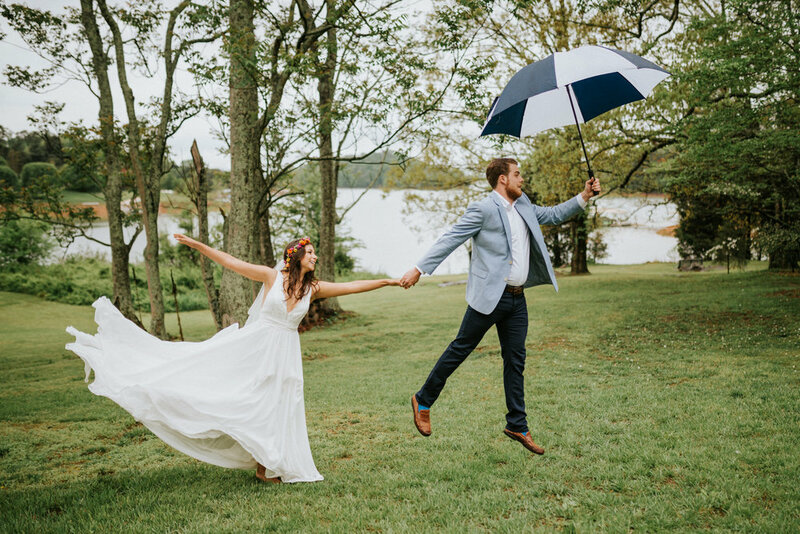 During the reception we got a terrible storm, but it made the atmosphere even more romantic as the candle lit reception continued with dancing and donuts! After a night of partying on the dance floor, the two left under a shower of sparklers. The perfect ending to a perfect day! 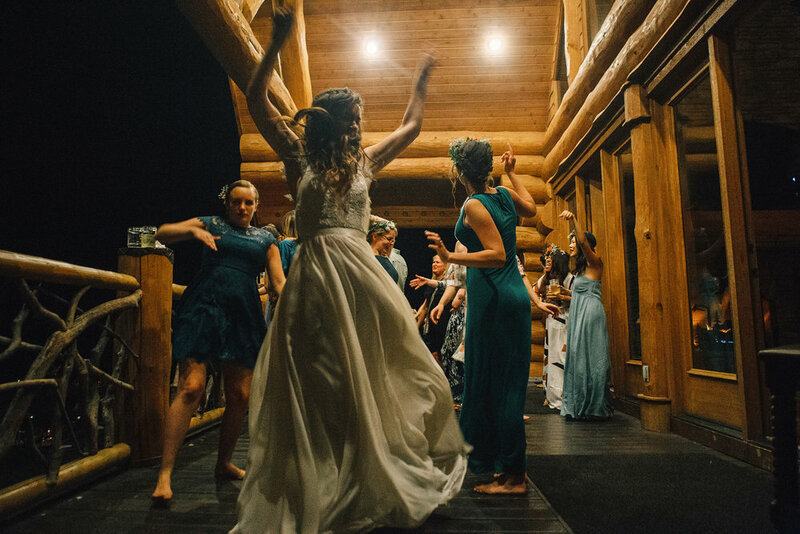 We are so thankful we got to be a part of this incredibly fun, bohemian style wedding and that I got to walk away with two new amazing friends. For more pictures and to pin your favorite parts, check out our Pinterest! Sometimes we get couples that make us so thankful we do what we do, and Corbin and Adam are one of those couples! When I met Corbin, I loved that she was so laid back and had the best smile. But when I met Adam, I realized how AMAZING the day was going to be! 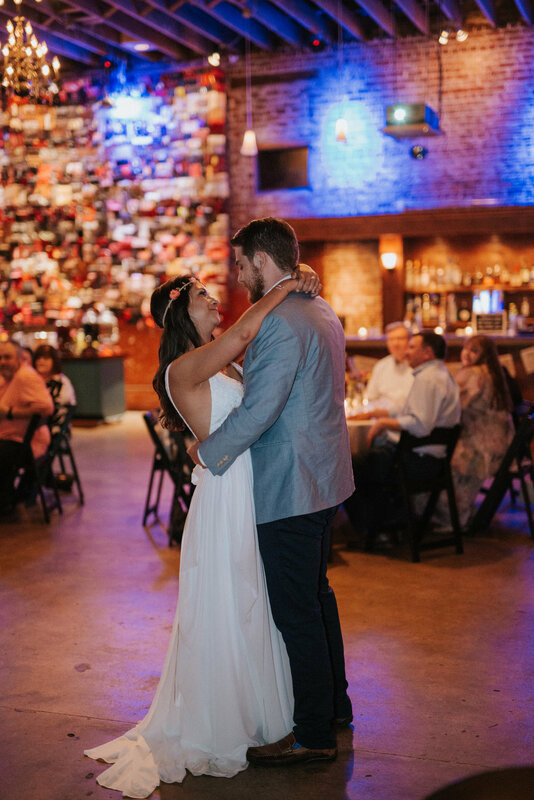 We're so glad Lindsay and Brandon Photography captured the day so perfectly! The two tied the knot at the Standard with a super fun bridal party cheering them on all day! The ceremony was one of the most joyous I've seen. These two love each other so much, and you can tell by the laughter and smiles they share. You can't help but be happy around them! The flowers were done by Abel Gardens and created a beautiful soft, romantic feel for the room. It was honestly amazing to see how much fun not only the two of them had, but the whole wedding! They were on the dance floor all night and gave them an incredible send off! We're so thankful to have been a part of such a joyous night! 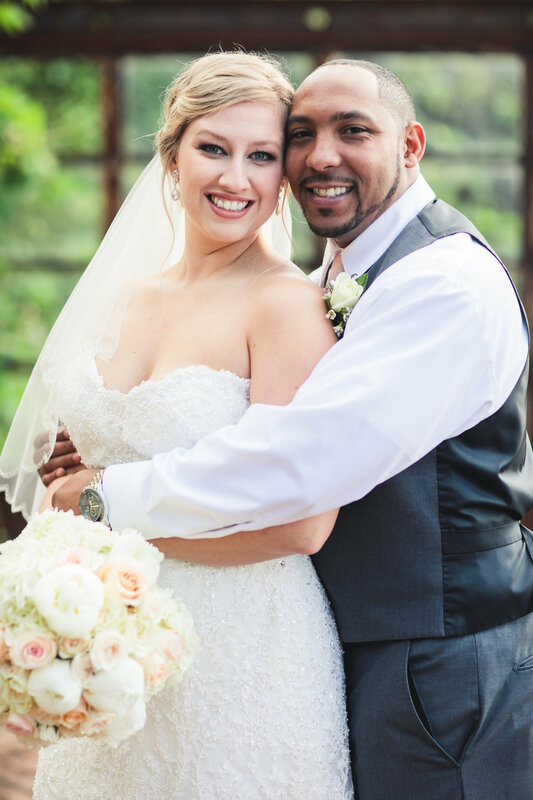 To see more of their amazing day, check out our Pinterest! This is Ashley, one of our lovely coordinators and genuinely one of my favorite people of all time. I love this photo of her because it's SO her. Even as a bridesmaid she was going above and beyond to make the day perfect, which is what she does for all our brides. Which is why when our team found out she was pregnant, we could wait to throw her a magical gender reveal party! Thanks to Stephanie Richer Photography for capturing the details and the fun! All photos provided by the amazing Stephanie Richer Photography! 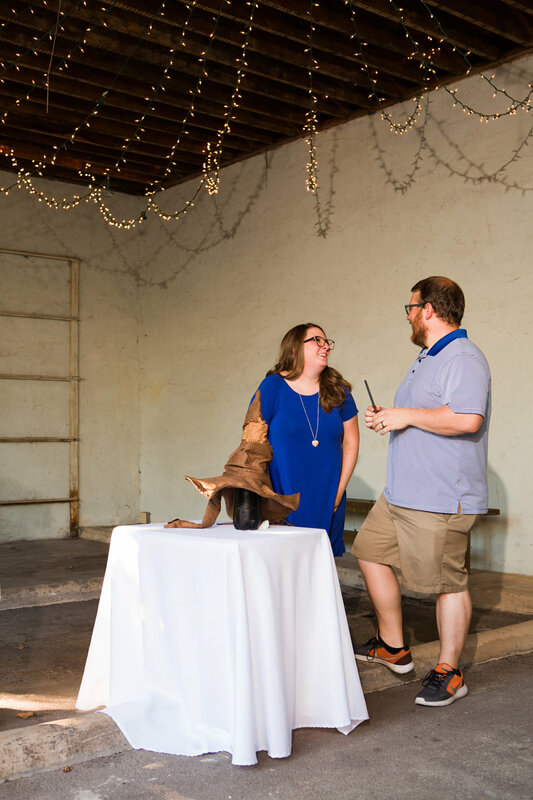 Ashley and her hubby, Brandon, are BIG Harry Potter fans so we thought it was the perfect way to find out if they were having a little baby girl or boy. We set the scene at Candoro Marble with suitcases and candles, and of course the books! The foyer playing the Harry Potter score was a magical entrance for guests. One of our other coordinators, Josh, is Ashley's BFF and he helped make these AMAZING wand favors so all the guests could be "chosen" by one and take it home. They knew that boy or girl, their little witch or wizard would definitely be a Ravenclaw so we made sure the little one would be decked out in the right attire. The Candoro main room was decked out with house colors and snacks of the magical variety, including Bertie Botts Beans and Polyjuice Potion. 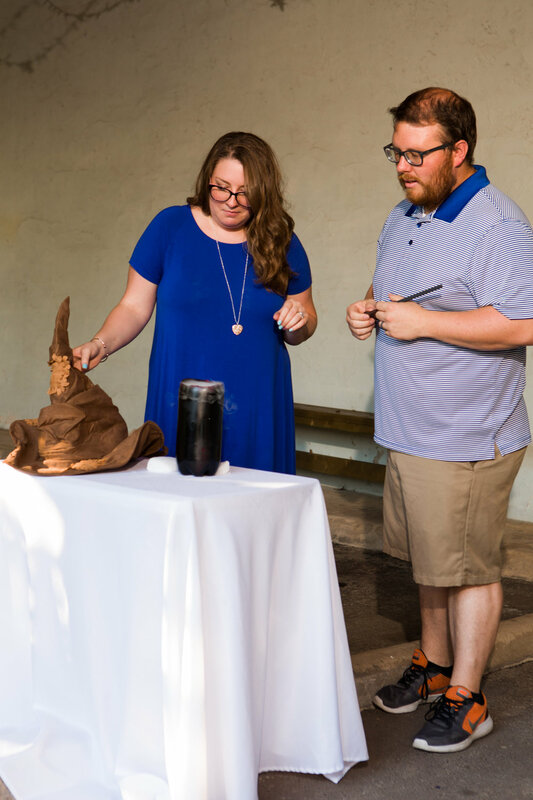 Guests put their gender guesses into the "Goblet of Fire" for a chance to win a big prize before heading out for the reveal. To find out the gender Ashley and Brandon consulted the Sorting Hat..
With much joy and tears...it's a girl! We couldn't be more excited to spoil her rotten when she gets here. Congratulations to Ashley and Brandon!! Thanks to the whole team for making the party magical. You can pin any of these party ideas one our Pinterest! Catherine and Jacob had the perfect spring wedding, and we were so excited they found us just a few months before they said "I do"! Kelli Linn Photography captured the whole day perfectly. 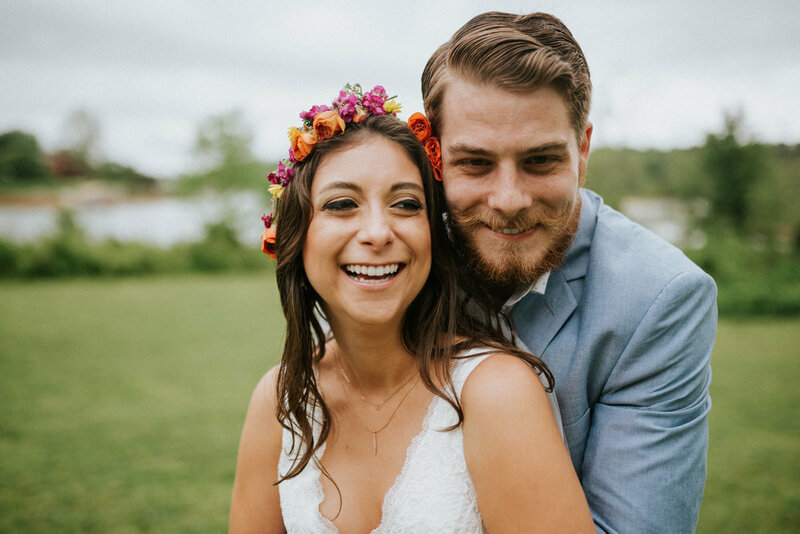 These two sweethearts had a ceremony before at the Mormon temple in DC, and then celebrated with a ring ceremony here at the gorgeous Reserve at Bluebird Hill. They chose a blush and blue palette that filled the room with soft color and beautiful tablescapes. 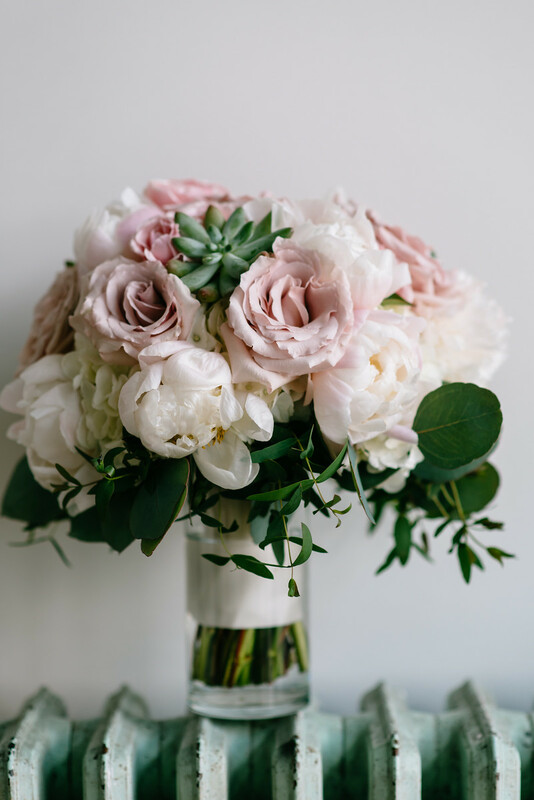 Melissa Timm Designs added stunning florals to complete the room, along with an AMAZING bouquet we couldn't take our eyes off of! The evening was filled with fun and laughter, complete with a dazzling sparkler send off! To see more of the details of their beautiful day, head to our Pinterest! Amanda and James were one of our sweet couples we were able to Day Of Coordinate for out near Memphis, Tennessee! The wedding and reception was held at the gorgeous, historic Twin Oaks in Humboldt, Tennessee. The Friday of the rehearsal, it was sunny, blue skies out but the morning of the wedding the rain came...which eventually turned into snow! The best thing about having a Day Of Coordinator is you never have to stress about a rain (or snow) plan! We grabbed our backdrop out of the car, and transformed the reception hall into a ceremony space. The bride and groom's first look was one of the most emotional and sweet we've ever seen captured perfectly by Evan David Photography. The ceremony was absolutely beautiful, and the reception fit the weather perfectly with it's cute and cozy coffee bar! We added some adorable signs to give the bride and groom a signature drink. James serves in the military, giving their cake cutting a unique twist! They braved the snowy cold for some stunning pictures, and the whole wedding party were troopers! After a wonderful ceremony and reception, the bride and groom were treated to a spectacular send off...military style! If you'd like to see more of Amanda's beautiful gown or the details of their big day, head to our Pinterest! Arvind and Anjali's wedding was such an incredible experience for our team. It was our first Indian wedding, and we could not have been luckier than to celebrate it with such a wonderful group of people. This amazing celebration was a stunning blend of south and north Indian ceremonies, full of joy, color, and love. All of these mesmerizing photos were captured by Bryan Allen Photo. I didn't actually get to meet this sweet couple until their engagement party, but I got to work with the bride's parents, Akhalesh and Veenita, who I absolutely adore. They're so kind and funny, and I love their spirit. The wedding began with a south India ceremony at their house. The groom was welcomed and then had a special ceremony, followed by the bride being welcomed and joining her groom for a garland exchange. The two shared in a sacred ceremony surrounded by friends and family. It was a cold day, but everyone was so happy it warmed the place right up! 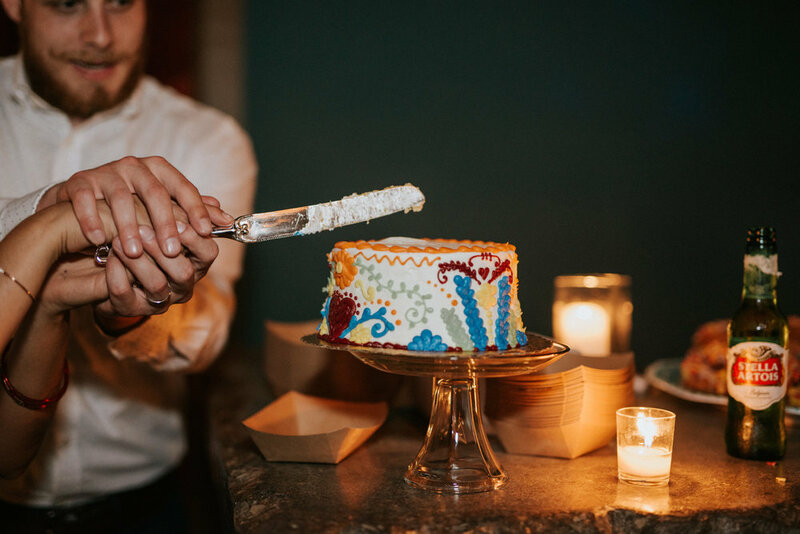 From there the days ceremonies turned into a fun and vibrant mehndi party at the Knoxville Museum of Art where guests had henna done, enjoyed toasts from the bride and grooms friends, and danced the night away to DJ Jaz. The theme for the evening was a peacock inspired look, and so we surprised the bride with a peacock made out of flowers! After a fun evening, the next day more festivities continued with the north Indian celebration at Springtree Farms. From the baraat to the brides entrance, all the way through the ceremony...every thing looked amazing with the backdrop of the mountains. After the ceremony, it was time for the reception! Beautifully set up by All Occasions, it was held in a large tent covering tables of purple, yellow, and green. The evening was full of amazing toasts, group performances, and a whole lot of dancing! The night ended with a spectacular fireworks display. Throughout all of the ceremonies, I was so lucky to be able to witness the love that Arvind and Anjali have together. They had so much fun and shared in so many special moments, it was easy to see that it is true love. To see all the gorgeous details of their wedding, head to our Pinterest. I don't think you could find a sweeter couple than Ali and Alex, and we were so thrilled to be a part of their big day! Ali looked absolutely stunning in her gown, and was surrounded by the kindest and most loving bridesmaids! Alex looked so handsome, and had a great group of guys behind him! 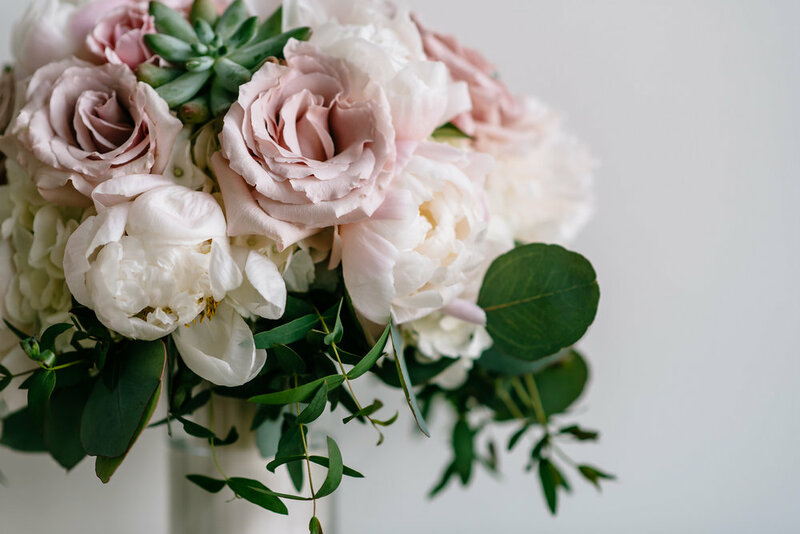 These two love birds went with a grey, navy, and blush palette to bring a delicate elegance to their spring wedding at The Standard captured perfectly by JOPHOTO! 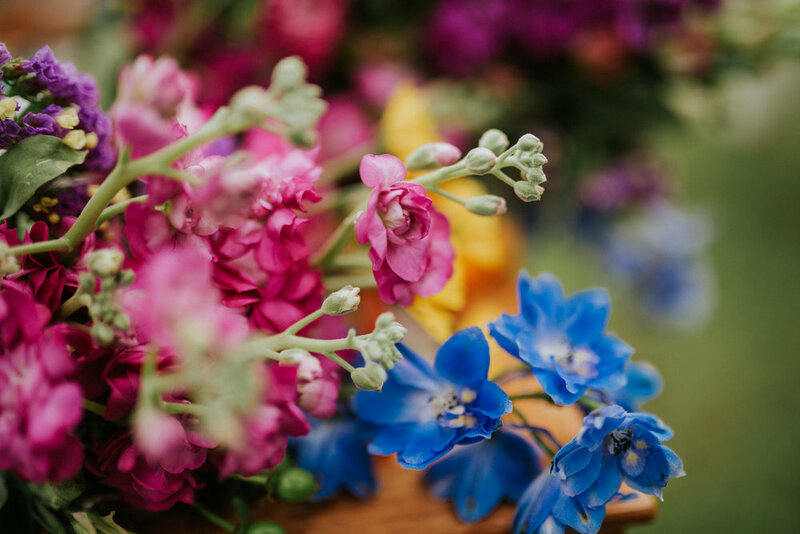 Megan Connors Floral Design put together stunning centerpieces and bouquets that perfectly reflected the beauty of the spring day! The tall centerpieces alternated with lower ones to give the room more height and variety. Instead of favors, the couple donated money to a cause that was near to their heart, the Shelby Foundation. Perhaps the most special moment of the evening was a special surprise Alex had for Ali during their first dance. 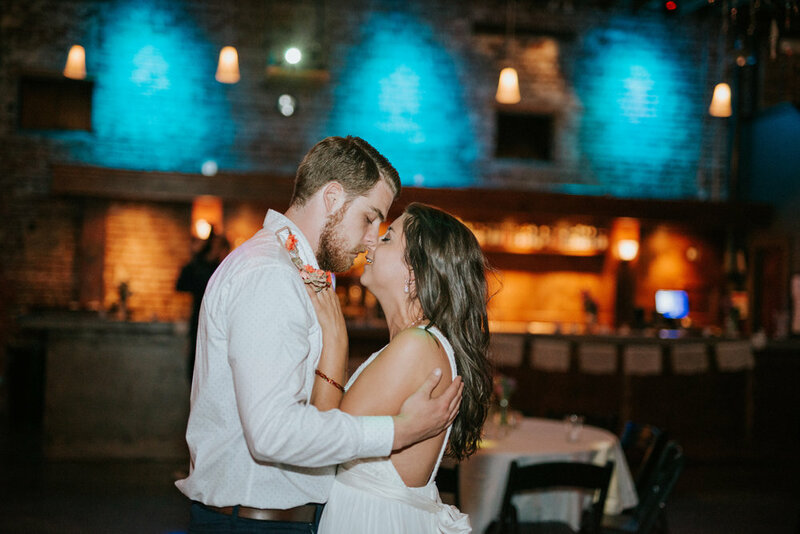 He had Ben Rector record a video of him singing their first dance song, and the surprise video had the whole room in tears. The entire evening was magical, and we were so happy to be a part of it! For more details and to pin your favorite parts for inspiration, head to our Pinterest! 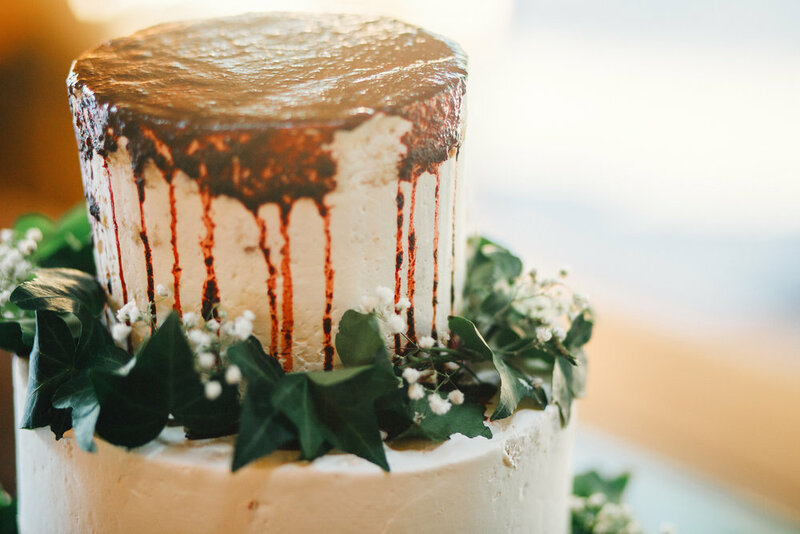 This sweet, winter wedding was overflowing with love and family. From the moment you see Pecolia and Ryan together it's evident that they are meant to be. 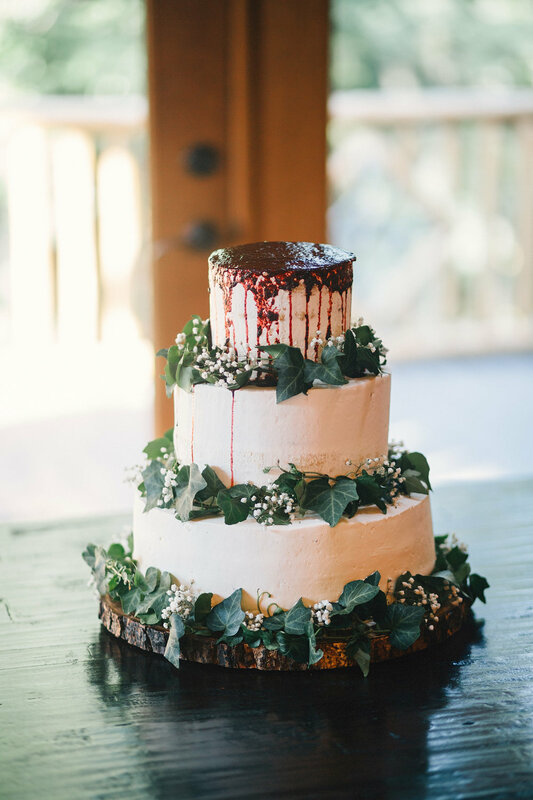 Their wedding was held at Ravenswood Mansion, a historic house in Brentwood, Tennessee. 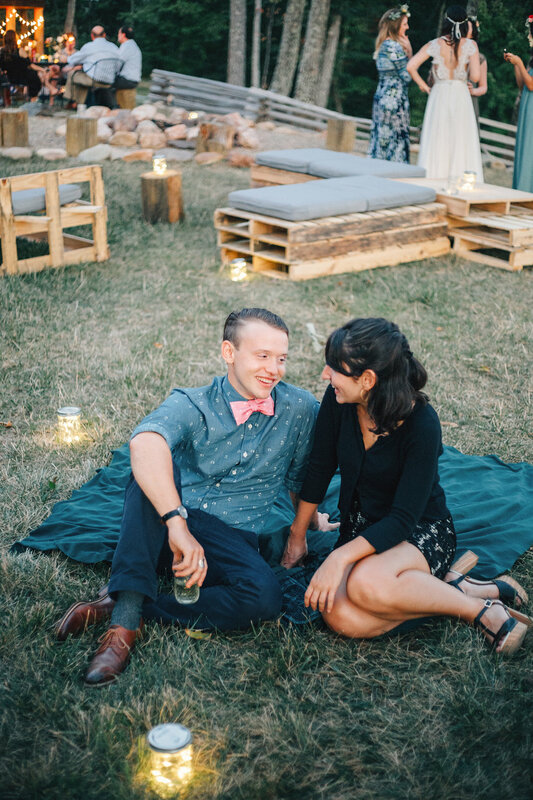 Pecolia and Ryan are two of the sweetest, happiest people you'll ever meet. You seriously love them as soon as you meet them. Pecolia had a stunning dress and heels that would make any bride drool! 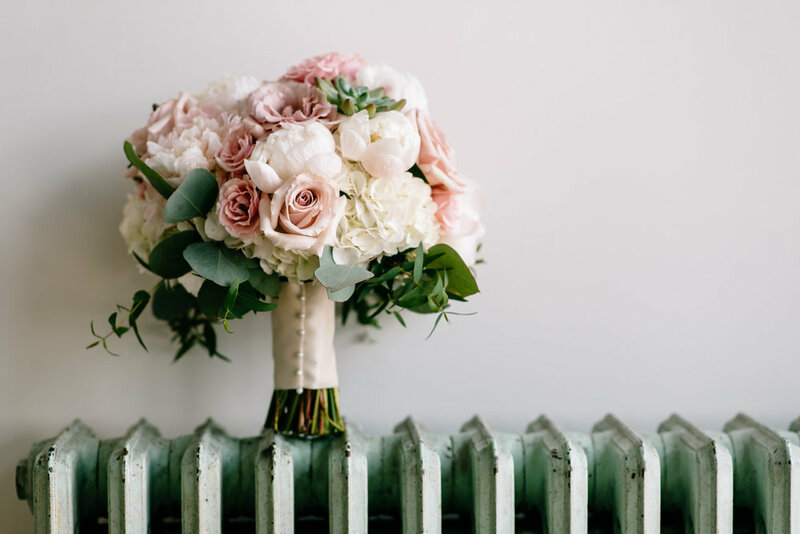 Her colors were marsala, grey, and pink...a perfect palette for a winter wedding! We thought that Pecolia and Ryan's first look was one of our favorites last year. It was too cute for words! The only thing that could make these two more swoonworthy is this adorable little one...who stole the spotlight with his cute suit and winning smile! We pretty much sobbed through their ceremony because they shared the most perfect vows we've ever heard! And the party that followed after was just as amazing! The groomsmen (fraternity brothers of the groom) did a sweetheart song for the bride, and the dance floor was packed. This was all leading up to the amazing snow-filled send off for the newly-weds! We loved being a part of their big day and are so glad to have them in our lives. If you want to see more of their gorgeous winter wedding, head to our Pinterest! 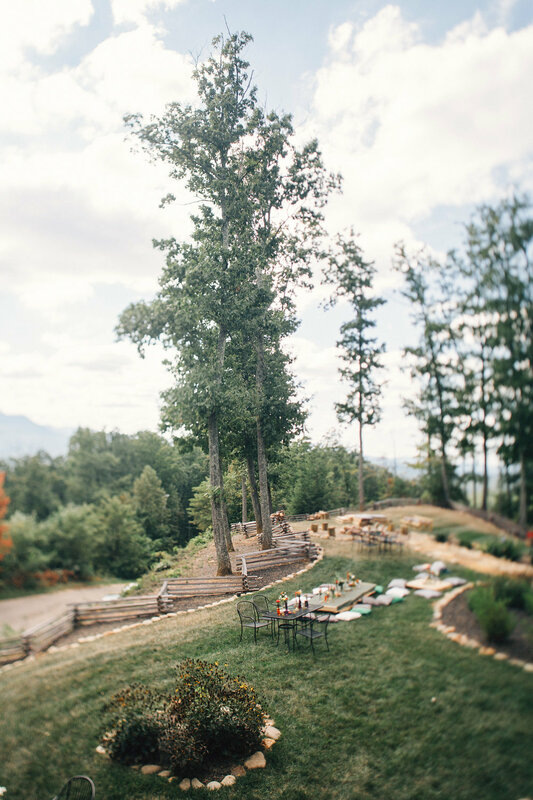 We love destination brides and grooms, and this Smoky Mountain wedding was one of our favorites from last summer. 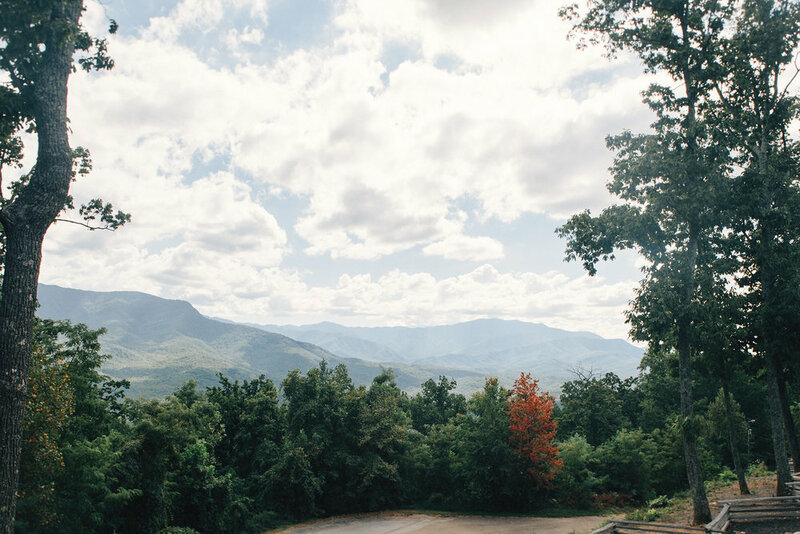 Chelsea and Jonathan came up from Florida to enjoy the stunning mountains of Tennessee for their special day. 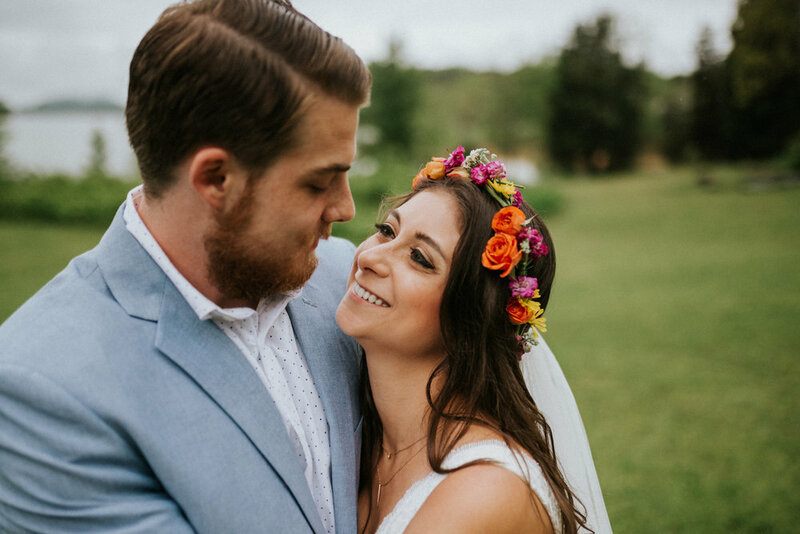 Chelsea wore a beautiful bohemian gown and carried lush greenery and baby's breath. They got married at the Wilderness Lodge in the Smoky Mountains, and enjoyed a secluded and intimate ceremony. The ceremony included a special mediation lead by close friends, acoustic music, and a shot to start their new adventure together! Surrounded by greenery, we simply added a vintage ladder and a garland with floral touches to give a nice backdrop for the ceremony. 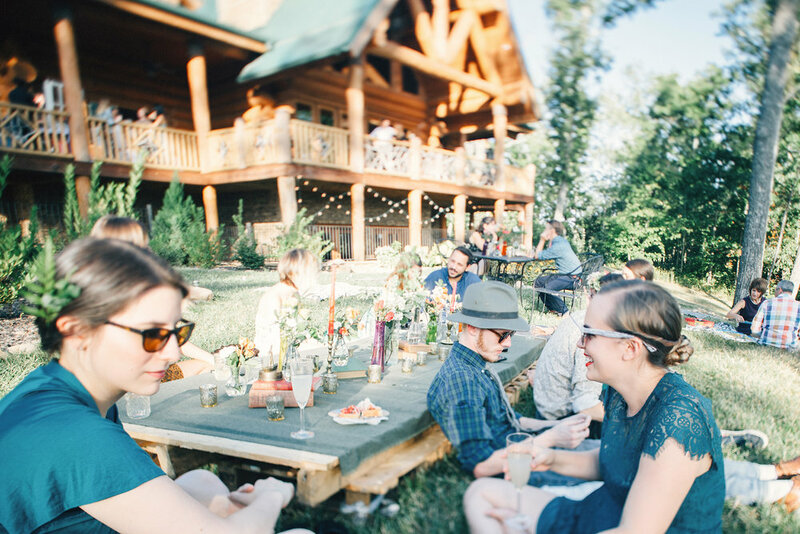 The reception was at that cabin and was a relaxed, picnic-style set up with a breathtaking mountain view. 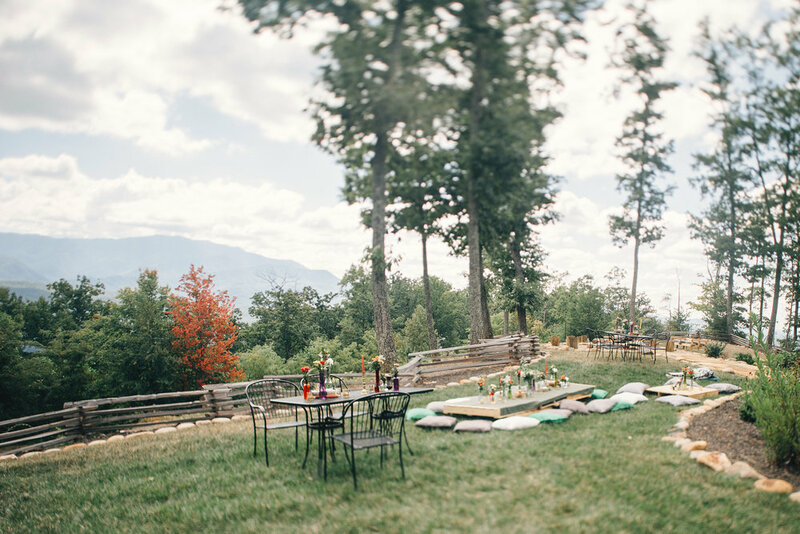 The tables and pallets for the reception were antique books and charming bohemian style bottles and wildflowers. Blankets and pillows scattered the ground so guests could enjoy board games, conversation, and dinner. The dinner was Mellow Mushroom pizza and the incredible cake was made by friends. 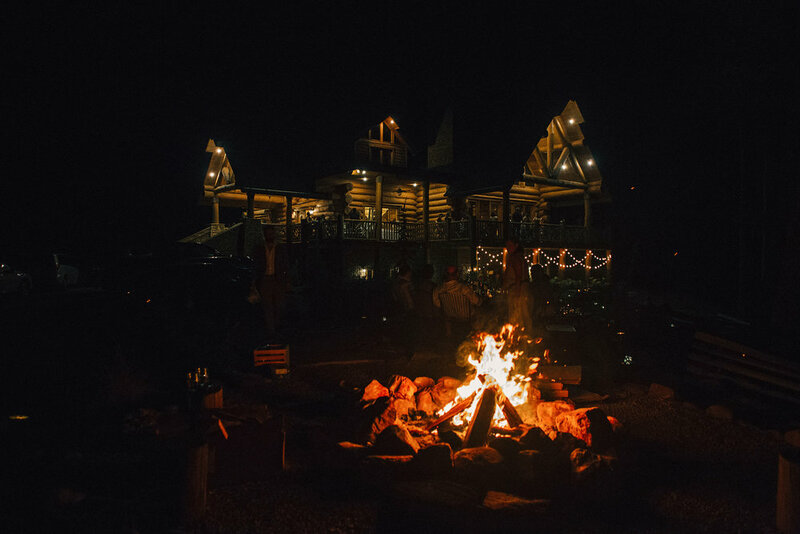 Guests spent the evening under the stars and bistro lights dancing the night away. We loved being a part of this wedding, and it was such a fun and magical night. It was amazing how much love was felt by everyone. For more pics and details of this lovely day, check out our Pinterest!